Wire baskets are designed to integrate with your current slatwall systems! Shop over 100+ slatwall fixtures & accessories! 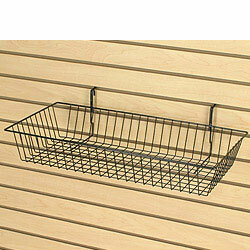 Wire baskets and other slatwall accessories are a great way to build a customized merchandising rack at a low cost. 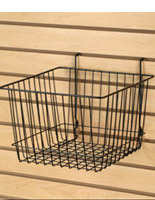 These wire baskets are 24"L x 12"W x 4"D and are designed to fit into all of our slatwall fixtures and panels. 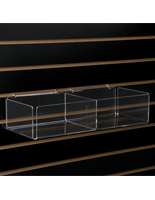 Because these wire baskets attach to the slatwall without any tools or mounting materials, changing your display is easy! Just insert the hooks into your slatwall and you are good to go! Slatwall fixtures like these wire baskets are perfect for retail and grocery stores that need to change their displays frequently. 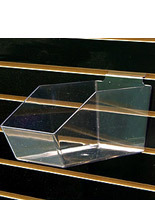 These display baskets give you the ability to display light to medium weight packaged or loose goods with convenience. 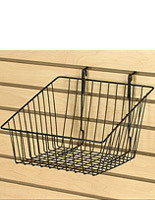 As one of our largest slatwall accessories, these wire baskets are ideal for holding your bigger merchandise. 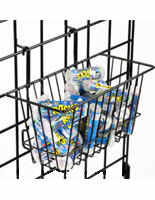 Constructed from high quality welded black wire, these metal display baskets are durable, yet economical products. They are also lightweight and allow more visibility of your contents than many other baskets and bins. 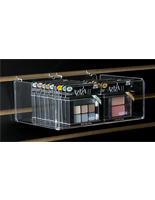 Slatwall accessories like these wire baskets are ideal for holding small, bulky products like candy, travel products, cosmetics and more! 12.0" x 4.0" x 24.0"